SINARQ – ITER – Instituto Tecnológico y de Energías Renovables, S.A. The SiNARQ project was financed under the ‘societal challenges’ chapter of the 2013 national research, development and innovation programme, part of the national scientific and technical research and innovation plan 2013-2016. The project proposes the manufacture of photovoltaic cells based on thin-film crystalline silicon (c-Si) and hydrogenated amorphous silicon (a-Si:H), with an integrated downconverter (or downshifter) for increased efficiency. The cells will be assembled in ITER’s photovoltaic modules factory and integrated at ITER’s bioclimatic buildings. To competitively synthesise and layer the downconverter on photovoltaic cells/modules. 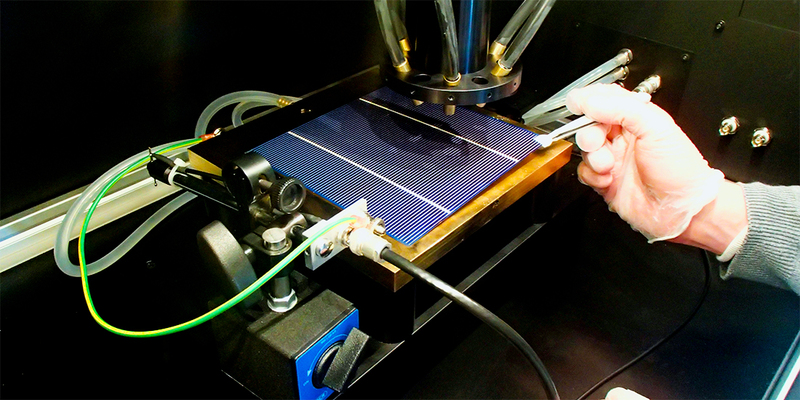 Full fabrication of silicon solar cells and stages of a-Si:H cell fabrication at ITER. A 0.4-0.5 percentage-point improvement in efficiency of photovoltaic devices with downconverter. Integration of the photovoltaic devices and glass slide with downconverter layer in bioclimatic buildings. Designing an industrial production line for integrating the downconverter, and appraising the relevant economic and business implications. The project is led by the University of La Laguna (ULL), and involves ITER and the Fraunhofer Institut für Solare Energiesysteme (ISE-FhG) as collaborating partners.